Convert files, rip DVDs, download or record any video and audio! This software is an ultimate multimedia converting tool, that can solve virtually all your video/audio converting needs. And what's important - it is absolutely free! Download our software right now and you will be amazed! All You Need in One Box! There are a lot of video and audio converters on the market. But most of them are commercial products and have a limited functionality. 99% of such converters are able to convert either video files, either audio files. So if you want to do something else, for example, download and convert video from YouTube, you have to spend a lot of time and money for new software. That's why we have develope Free Media Converter. It allows you to convert audio and video files, download videos from online sources, rip DVD-video disks, and even record video and audio from your webcam or desktop. 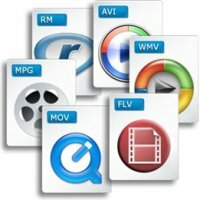 Convert video and audio files. Almost all known video and audio formats are supported on input. Among them: MP4 (MPEG-4, H.264), AVI (xVid, DivX), MKV, ASF, VOB, MPG, WMV, MP2, FLV, SWF, MOV, MP3, AIFF, AMR, AU, FLAC, AAC, AC3, M4V, WAV, WMA, MP2, OGG etc. You can easy and fast convert your DVD collection to all popular video and audio formats. Protected DVDs are supported as well. Found cool online video? With Free Media Converter you can download and convert videos from all popular online resources, such as YouTube, Hulu, Facebook, Google Video and many more, including adult sites. This software allows you to record your own videos from different sources. You can capture video from desktop or a part of the screen. You can also record video from web cam and record audio. Then you can convert recorded video/audio to any supported multimedia format. The Free Media Converter not only allows you to import video in many ways, it also supports a lot of output formats. Among video formats: MPEG-4, H.264/MPEG-4 AVC, DivX, XviD, AVI, MOV, M4V, MPEG-1, MPEG-2, 3GP, 3GPP, ASF, FLV, SWF, VOB, WMV, MKV, DV, Super VCD, VCD , DVD and HD video. Supported audio formats: MP3, OGG, WAV, AAC, FLAC, M4A, MP2, AC3, AIFF, AMR, WMA. In addition to common video and audio formats, this program is able to convert media to formats optimized for specific model of multimedia device, portable video player of cell phone. Among these devices: iPod, iPhone, iPad, PSP, Archos, Xbox, HTC, Nokia, Motorola, Sony, Samsung and many more. Free Media Converter also has several tools for editing and adjusting video and audio. Thus you can trim the file if you don't need to convert the full-length video/audio. Or you can crop the video frame, change aspect ratio and adjust brightness, saturation or contrast. The software even allows you to merge converted fiels on output. The innovative multithreaded converting engine decreases to minimum the time of conversion. It is optimized for multi-core processors, so you will be amazed by the speed of the software. As well as by quality of converted media. Why wait? Download Free Media Converter right now! It is 100% freeware, and does not include any malware (see awards below). Supported operating systems: Windows 10/8/7 (32 & 64 bit), Windows Vista, Windows XP. © Copyright 2012-2017 FreeMediaConverter.org. All rights reserved.